The MI-8 operated in several major IAF operations,including Operation Meghdoot in the Siachen Glacier and Operation Pawan in Sri Lanka and in the Chennai floods in 2015. BENGALURU: The Soviet-era MI-8, the backbone of the Indian Air Force helicopter operations, was phased out today, bringing an end to its glorious service career spanning 45 years. 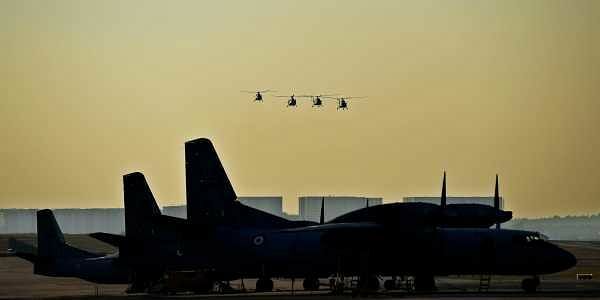 The Air Force had already phased out the 107 MI-8 helicopters, also known as 'Pratap' and the last chopper stopped its rotor at the Air Force Station, Yelahanka today. A grand ceremony preceded the end of the MI-8 helicopter's service. Veterans headed by Air Chief Marshall (Retd) Fali Homi Major flew the last MI-8 mission along with the other crew members. 112 Helicopter unit based at Yelahanka station is the last unit to operate this formidable platform. The station housed an MI-8 squadron. Recalling the service of MI-8,Air Marshal Nair said "Ever since the rotors churned for the first time, this helicopter played a very significant role right from the glaciers of Siachen, down to Andaman and Nicobar Islands and even across the littoral islands we have around our country." "Whether it is the deserts of the west or the far east, Vijay Naga, Gandhi Gram, this helicopter played a very vital role in day to day living in the inhospitable conditions... This helicopter also has a unique distinction of being in Antarctica and operating from Antarctica." He said the MI-8 operated in several major IAF operations,including Operation Meghdoot in the Siachen Glacier and Operation Pawan in Sri Lanka. The last relief service it participated in was the Chennai floods in 2015. Retired Air Chief Marshal Fali Homi Major got nostalgic. He said he grew around this helicopter since 1972. Formally inducted in 1972 and rechristened as "Pratap", MI-8 took part in several major IAF operations, including Operation Meghdoot in the Siachen Glacier and the Indian Peace Keeping Force operation in Sri Lanka. IAF inducted 107 MI-8 helicopters between 1971 and 1988. The Pratap could carry a weight of 4000 kgs, of which 3000 kgs can be external, with its multi role capabilities. It could carry 60 bombs of a total weight of 1000 kgs.